In its latest flexing of muscles, Iran’s military has declared that it drove a US warship away from the area of one of the largest naval, air, and ground exercises in recent history. 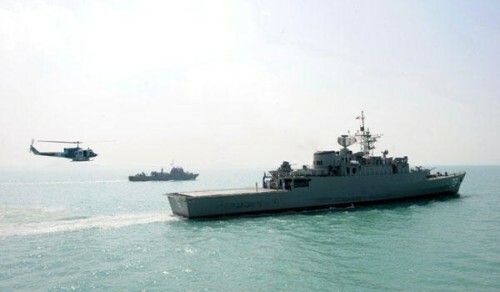 The military said that the warship retreated on Sunday after a warning issued by an Iranian naval patrol aircraft, which also told “warships from other extra-regional countries” to leave. Iran’s military is in the midst of a six-day exercise Mohammad Rasoulallah (Mohammad, the Messenger of God) in the southeast of the country and the Persian Gulf. Demonstrations have included missiles, anti-tank weaponry, and a “suicide drone”. Navy chief Rear Admiral Habibollah Sayyari said that a zone marked for firing missiles and torpedoes has been established and that mines will be laid to prevent a mock enemy from entering coastal area. He said those who refuse to leave the exercise zone will be held responsible for any consequences. The Iranian Air Force’s F-4 Phantom fighter jets will also be participating. The contrasting messages from President Rouhani and the Supreme Leader for Christmas and the New Year continue. The Islamic Revolutionary Guards Corps has acknowledged the death of one of its veteran commanders while he was deployed with Iraqi forces fighting the Islamic Front. The Guards said Brigadier General Hamid Taghavi, commander of the IRGC’s Ramazan Headquarters during the 1980-88 Iran-Iraq War, died in Samarra, 125 km (75 miles) northeast of Baghdad. Iranian commanders have advised Iraqi forces in the defense of Samarra, the site of two Shia shrines, since it was threatened by the Islamic State’s rapid advance in June. NextSyria Daily, Dec 28: Has Assad Regime Used Napalm on Civilians in Homs?